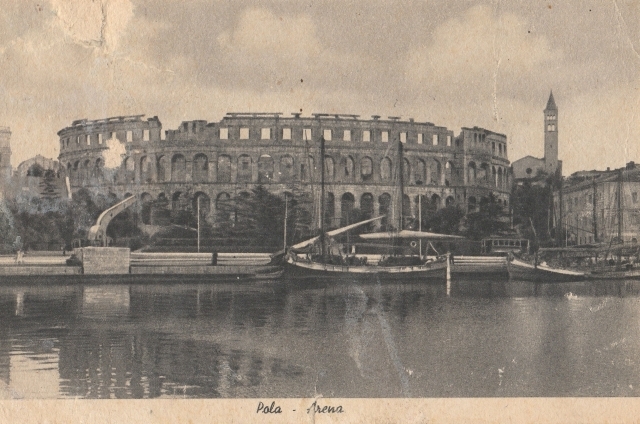 Among my collection of old postcards are a few of Pula, Istria's biggest and southernmost city. Two feature its most famous landmark, the 1st century arena, known as one of the world's best preserved Roman amphitheatres. 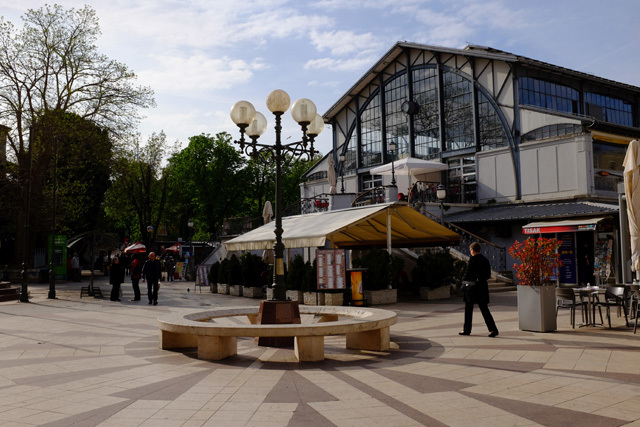 But I find the ones of Pula's market much more interesting. 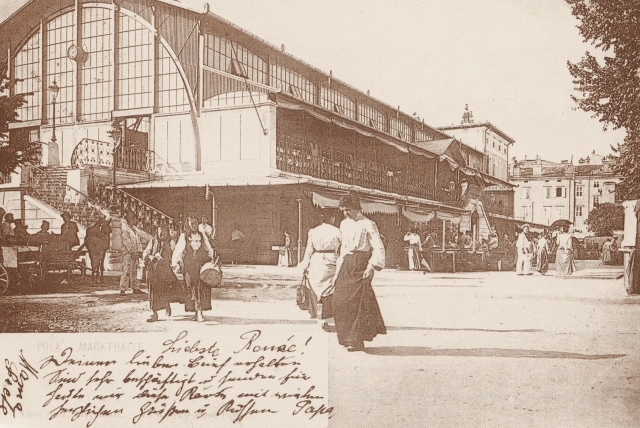 In the image below we see the iron and glass market building built in 1903 during the Austro-Hungarian empire. It was restored in 1997 and today it looks a lot like it did 115 years ago (see photo later in this post). The fish market is located on the ground floor while on the upper level reached via the wrought-iron staircases are a few shops and cafes. I'm fascinated by the people we see in the foreground. 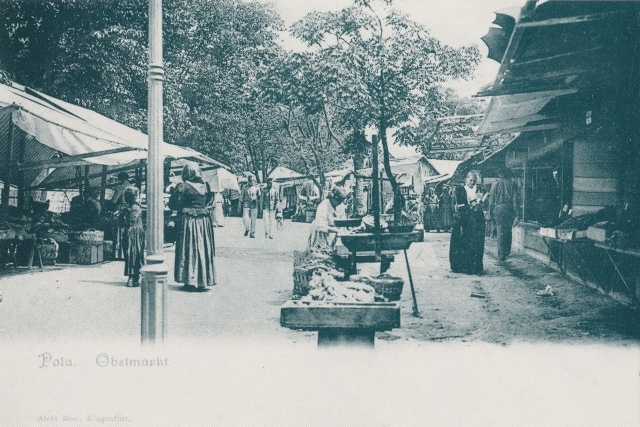 In the centre of the photograph we see two elegantly dressed women carrying handbags who have probably come to shop at the market. And it looks like a woman to the far right is carrying a parasol. In contrast, a pair of women on the left look more like country folk and are wearing headscarves and carrying baskets. They've probably come to sell their goods at the market. 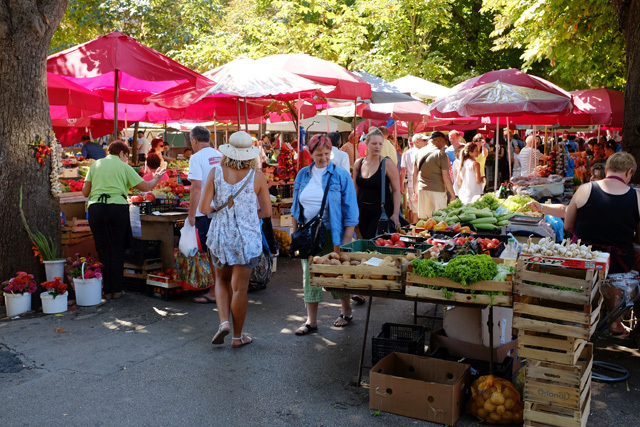 This photo is of the outdoor fruit and vegetable market which still takes place here daily under neat rows of chestnut trees and bright red umbrellas. The original stone tables are still here and the vendors are still mostly women who come from the countryside and sell their fresh produce to the city dwellers. But unlike 100 years ago, they're dressed a lot like their customers. If you look closely you can spot two soldiers or military men strolling through the market. 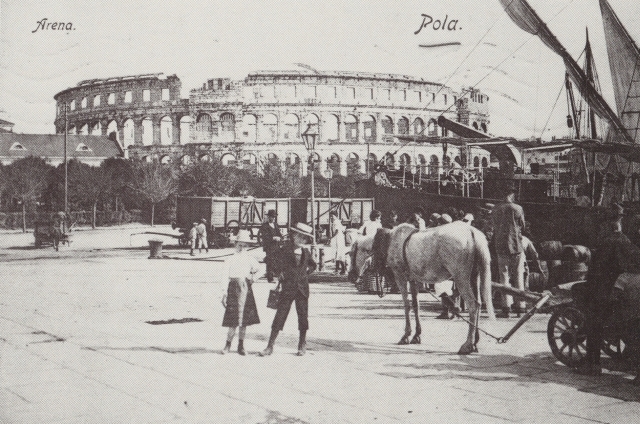 During the Austro-Hungarian Empire, Pula was the empire's naval base. Maybe you've noticed that I'm a little obsessed with olive trees and olive oil. This obsession started here in Istria after I tried fresh new olive oil for the first time. I can't go back to supermarket olive oil ever again – it's just nothing like the real thing. I look forward to the olive season every November when we help our neighbours pick their olives and head to a local producer to buy a year's supply of freshly-pressed olive oil. I've been indulging my olive oil obsession not only by using it in the kitchen but also by writing news articles about all things related to it for Olive Oil Times. 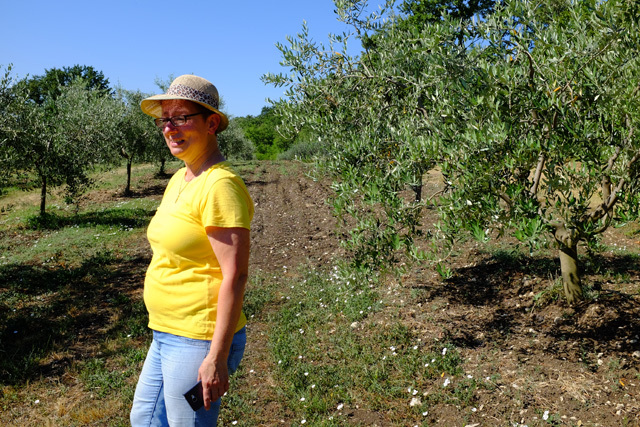 Sometimes I have the chance to write about the local olive oil scene here in Istria. I'm sharing two articles here I especially enjoyed researching and writing.